However, I’ve discovered that often the deepest roots of the pain are not in the body. Since we humans are much more than physical beings, our emotions, thoughts, and spirituality all affect, and perhaps cause, the physical pain you might be experiencing. What I love about the healing modalities I practice is that they (and we) address all aspects of healing. Moreover, rather than focusing on symptoms, these modalities act with the underlying causes. When you clear out the consciousness of feeling overburdened, your back pain may disappear completely; when you clear out trauma you’ve experienced around injustice, your vision may become clearer, and so forth. When we focus on the whole person and work with the consciousness of each part of the body, the results can be dramatic! If you have completed BodyTalk Fundamentals, you may want to know that I’m teaching a course focused entirely on Consciousness in January. This is the heart and soul of BodyTalk. Because it expands your attention to the consciousness issues everyone deals with, this course will have a huge impact on your practice, your results, and even your ability to talk about the balances that arise. It truly is an amazing class. I hope you can join me! But not to worry if you haven’t taken Fundamentals and/or if you are not in a healing practice. If you have trauma you want to heal or specific physical or emotional discomfort that you want to address, we will work together to clear out whatever stands in the way of full health and wholeness. Another reason the above quote is so powerful is that it speaks to the ground of all being: Love. 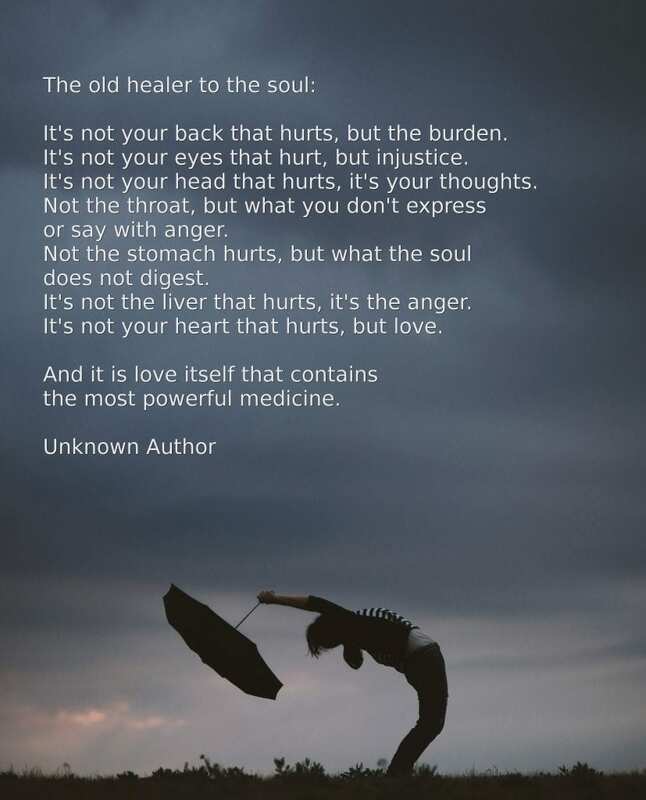 How does Love contain most powerful medicine? Because the deepest and most powerful healing you can do is with yourself. When you can love yourself—fully and deeply—as you are and not how you want to be, or think others want you to be, but as you are—right now—in this body with these challenges and in this crazy world—that love heals the very deepest parts of you. But it doesn’t stop there. Loving yourself always expands to love for others. When you express and convey love for others, the ripple effect is stunning. It heals you and it heals your ability to make and sustain healthy, mutually giving relationships. And here’s the bonus: Every act of love, every act of lovingkindness, helps heal the world. You see, the consciousness of each part of our body is mirrored in the world. When you heal yourself, you inevitably affect those in your families and communities, and, because we are all connected, you have an impact on our planet. The world desperately needs this medicine. Whatever country you live in, whatever your job is, whatever is happening around you, people today are in such need of love and loving kindness. I encourage you, for so many reasons, to heal the places inside you that need your love. I am passionate about in serving people in this way, so please check out my individual sessions page on my website if you are interested. My challenge to all of us, especially now when so much incivility and hatred abound, is to reach out to at least one person a day and offer love. Start by doing just one act of kindness per day. Then please let me know what happens. Really. I’d love to hear from you! You see, love and fear, love and hatred, love and judgment, cannot exist in the same space. Every act of love moves you through fear. Every act of love banishes hatred. Every act of love takes you beyond judgment. Doing one act of kindness per day will change you. I guarantee it. And it will change the world. It is truly the best medicine available to us now.